Destiny 2 update 2.2.1 is shaping up to be one of the best updates in ages. On top of better Black Armory and Strike farming, today Bungie announced that the update will also make the unique weapons available from Gambit Prime and The Reckoning much easier to obtain. Not two weeks ago, a friend and I were grinding The Reckoning for hours only to receive four weapon drops between the both of us (three of them mine). He suggested Bungie add an Escalation Protocol-type mercy rule to the new weapons which guarantees you a drop at some point. I'm delighted to see Bungie adding that exact system to Gambit Prime and The Reckoning on top of a flat drop rate increase, and I have to admit, given the timing I'd have thought it was an incredibly cruel April Fools' joke were it not for the words of community lead Deej. Honestly, this change may be the best part of update 2.2.1. It stands to fix multiple issues with Destiny 2: Joker's Wild. Firstly, Gambit Prime is unrewarding, with matches often giving out worthless blues. Adding weapons to the loot pool will definitely grease the Prime grind. At the same time, once you build a Gambit Prime armor set, these weapons are the only reason to run The Reckoning, so making them more common will make it more appealing as well. Perhaps most importantly, the Drifter weapons are the only ones that can roll with many new weapon perks, including several tier-one options. There are dozens of great roll combinations on them, but their drop rate has been so poor that players haven't been able to experiment with them yet. So, on top of making the premier Joker's Wild activities more exciting, this update could also diversify the weapon meta, which is always a good thing. 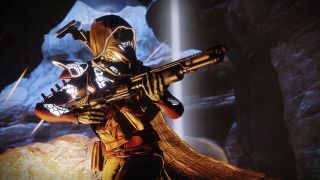 We've got some Destiny 2 Gambit tips and a Destiny 2 The Reckoning guide to help you prepare for the inevitable post-update grind.